As I popped out for coffee and to run some errands on Saturday, I was surprised to share the elevator in my apartment building with a girl scantily dressed as an elf. I have noticed New Yorkers' fondness for dressing up before but at 11am in the morning, this seemed a little odd. Later that evening, on my way to some friends' holiday party, I noticed quite a few people dressed as Santa, some of them in advanced stages of inebriation (read "passed out on the pavement") even though it was barely 8.30pm. Just when I thought this City had gone completely Christmas mad this year, it finally dawned on me the next day that it must have been SantaCon! And indeed it was. 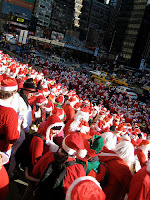 SantaCon is, according to their website, a "non-denominational, non-commercial, non-political and non-sensical Santa Claus convention that occurs once a year for absolutely no reason". Which from what I can tell is just a brilliant excuse for a lot of people to dress up, get drunk during the day and loudly spread some holiday cheer. If you happen to be near one of their meeting points in the City for the day, I hear it can be quite a sight as the picture shows! My hatred of crowds means that I will never partake but it is one of those rather random New York traditions that you never hear about until you live here.